Woody's targets are made from sturdy 4mm recycled wood with an integrated stake. Woody's Targets are more versatile than, and will outlast paper. The wood is an engineered product made from exploded wood fibres that have been highly compressed. Because there's no grain, the bullet doesn't tear through; it punches perfect holes by removing only the material the bullet contacts. 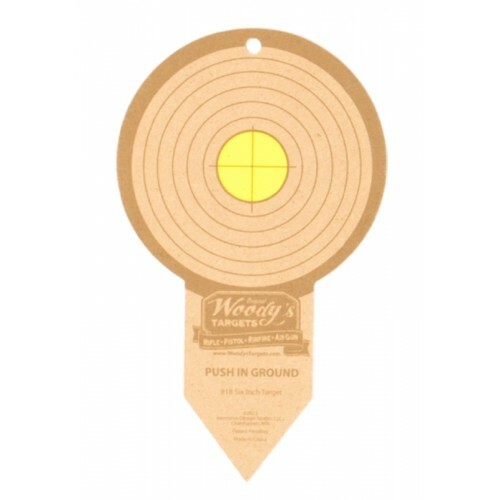 Woody's Targets work with all calibers; from BB's to .50 cal. Just stake it in and shoot! - no target stand required. A traditional target; you have a full six inches to make your shot. The high visibility, yellow center provides the perfect aiming point.